In a statement in the wee hours of Monday, Saudi Arabia laid the blame for the attack directly at Iran's feet, claiming it would not have happened had Iran not been supporting Houthi rebels in Yemen. 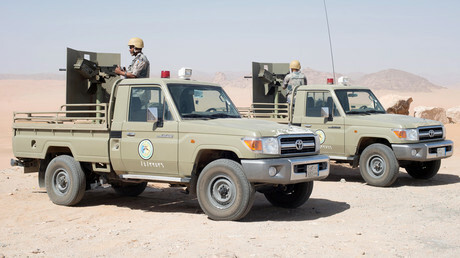 "Iran's role and its direct command of its Houthi proxy in this matter constitutes a clear act of aggression that targets neighboring countries, and threatens peace and security in the region and globally," the statement, published by the official Saudi Press Agency, reads. "Therefore, the coalition's command considers this a blatant act of military aggression by the Iranian regime, and could rise to be considered as an act of war against the Kingdom of Saudi Arabia." Saudi Arabia also said it "reserves [the] right to respond to Iran in the appropriate time and manner." The Saudi-led military coalition also announced it was closing off all land border crossings, seaports and airports in Yemen in response to the missile launch. The coalition has been fighting against Shiite Houthi rebels, who took control of the Yemeni capital, Sanaa, in early 2015. The Saudis are backing ousted Yemeni President Abdrabbuh Mansur Hadi. On Saturday, a ballistic missile was launched from Yemeni territory, allegedly targeting the King Khalid International Airport near the Saudi capital, Riyadh. It was intercepted and landed "on the airport's grounds" causing little to no damage, according to Saudi Arabia's civil aviation authority. No flights were disrupted by the attack. Houthi rebels claimed responsibility for the attack, saying the Volcano-1 ballistic missile was domestically produced. Saudi Arabia, however, is accusing Iran of supplying the weapon to the Houthis and thus enabling the attack. Iran, while backing the rebels, has denied arming them.